Draigoch's Lair is, unsurprisingly, home to Draigoch - one of, if not the last of the Great Dragons of Middle Earth. It is a "lair boss" style raid, but substantially more difficult than the Watcher, the previous endgame lair boss. Draigoch is a lv75 instance, and has locks which reset on Thursday mornings. The RoE recommended group composition is as follows. Note that this is assuming a full on-level raid group. If you are running the instance as a 24-man raid, take this recommendation as your first 12 slots, and you can use randoms for the remaining 12. The Tank will be responsible for tanking the Draigoch's head. They will need to be able to spot Draigoch's tells for which way he is about to move, and quickly pass this information to the rest of the raid. Note that if the tank gets this wrong, they will almost certainly cause a wipe due to the mechanics of the instance. Healers will be healing as usual. There will frequently be out-of-combat moments to res anybody who happens to die during the instance, so in-combat resses are less of an issue in this raid. Will be expected to buff the raid, and be ready to provide off-healing if a member of the raid is in danger of dieing. Oathbreaker's Shame is highly recommended for maximising DPS on Draigoch's body during the times when Draigoch is on the floor. Will be required to pop a lot of conjunction on Draigoch's body over the course of the instance. As such, it's important that you have all CJ starting abilities be usable. In addition to Exploit Opening, trait 5 red + capstone so that you can use Improved Feint Attack to enable Trip to be used outside of stealth. Bring Marbles (crafted by Weaponsmiths) and trait Exposed Throat as additional backup sources for CJs. All randoms will be expected to contribute to maximum DPS, so DPS traitlines and weapons are preferable. Additionally, the instance favours melee DPS, who get a higher percentage of bonus damage compared to ranged and tactical classes later during the fight. Draigoch is a long and complicated boss fight, at least until the raid becomes familiar with their surroundings and the tactics. You will want to split your groups so that all burglars are in the same fellowship, which other players who are also happy to be involved with performing CJ's. Everyone else will be in group 2. The raid leader should specify a CJ order, where each player will always go in the same position (ie, First, Second, Third etc). It is advisable to let the Burglars take up the earlier slots, as they will be more aware of when a CJ is about to be executed and can lock in faster. At the start of the raid, players need to make their way past 4 "lanes" of a gauntlet. each lane has several holes in the wall, through which draigoch will try to spot you. You can tell where he is looking by the searchlights that shoot out of his eyes, clearly identifying which gap he is looking through. When he's looking though a different hole to the one you need to pass, it's safe to run past it. Be careful, as sometimes he moves quickly to another hole shortly after the first. If Draigoch sees you - "There you are!" - You will be barbecued. That's a one-shot if you hadn't guessed. After you have made it past all 4 lanes, you reach a safe area on a cliff. Wait there for the rest of the raid (and laugh at their failure!). When the raid has arrived, all stand on the weak floor to collapse the floor. You will now find yourself on the top floor of the arena. 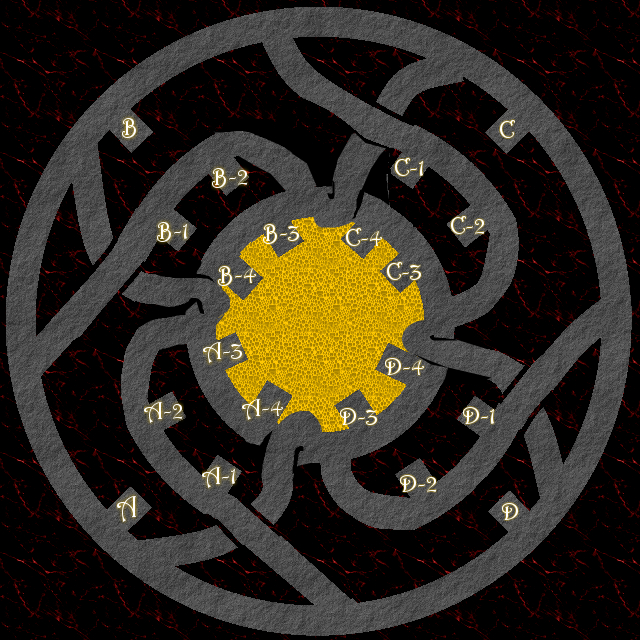 The arena has three floors in a ring around the treasure hoard, plus the treasure hoard in the centre of the map on the ground floor. The middle floor is where Draigoch's front claws will grip the wall. This floor consists of four distinct platforms with ramps going down to the ground floor in a clockwise direction, and ramps going to the top floor in a counter-clockwise direction. You cannot run a full ring around the arena on this floor, as it's essentially a tunnel connect the bottom and top floors. Each platform has two "Windows" where Draigoch's front claws will be located (Marked A-1 & A-2 etc). These platforms are located directly underneath the tanking platform, with the claw "windows" either side. To climb to the middle floor from the group floor, you need to find the ramp one compass point clockwise from the tank. For example, if the tank is on the South-West platform, you need to climb the West Ramp. If the Tank is in the South-East platform, you need to climb the South Ramp. The bottom floor is where Draigoch's back claws will grip the wall, and also offers access to the treasure hoard through any gaps in the wall (Note that trying to run into the treasure hoard before Draigoch is knocked off the wall will get you insta-killed). This floor is a full ring around the arena. From the bottom floor, any ramps going upwards in a clockwise direction (located on the inside of the ring - the side closest to the treasure hoard) will take you direct to the top floor. The raid will ignore these, unless there is an emergency with the tank group (such as a rez being required). Any ramps going upwards in a counter-clockwise direction (located on the outside of the ring - the side furthest from the treasure hoard) will take you to one of the platforms to the middle floor. There are 4 ramps to the middle floor (Roughly: North, East, South & West), and 4 ramps to the top floor (Roughly under the tanking platforms: South-West, North-West, North-East, South-East). After collapsing the floor earlier, you will find yourself on the top floor (Just south of Point D on the above map). The tank and their healer (if applicable) will proceed clockwise until they find the Treasure Chest on the South-West platform (point A on the above map)- Using the chest will activate the boss fight, so don't use it until everyone is in position and ready. The rest of the raid will also run clockwise, however will take the first right down a ramp which takes you to the middle platform (Point A-1 on the above map). You will wait here in the tunnel for the first claw to appear (do not stand out on the ledge or you may take heavy damage in the opening few seconds). Draigoch has a set of 12 new and unique conjunctions which need to be executed in a specific order. These will weaken him, making the raid easier and faster to complete. Conjunctions can only be executed on Draigoch's Body, and only when he is knocked off the wall onto the floor below. It doesn't matter what order you complete the 4 CJ's in each set. Only that you complete one set before moving on to the next. Affects Claws: +100% Incoming Melee Damage, +50% Incoming Ranged/Tactical Damage. Each conjunction affects one claw. Affects Body: +25% Incoming Melee Damage, +12.5% Incoming Ranged/Tactical damage. Stacks 4 times, once per FM. Affects Body: Deals 5% of Draigoch's max health for each FM. Once the chest is activated, Draigoch will give a lengthy speech before jumping onto the cliffs for the fight to begin. The style of combat is very similar during all three phases of Draigoch. Once Draigoch enters combat by jumping on the wall, the Tank will pick up agro on the head. Since nobody will be hitting the head apart from the tank, maintaining agro is not a problem (apart from any agro generated by a healer). The tank should therefore be focusing almost purely on a defensive rotation. Wardens will want to keep up maximum self-healing and defensive gambits at all times. Meanwhile, the raid will be DPS'ing down Draigoch's Front Left Claw, then the Front Right Claw. They will then head downstairs to defeat the remaining two claws. Be aware however that early on, Draigoch will likely move after killing two claws on average. Draigoch the Red says "I shall scorch you until nothing remains!" The tell for Phase 1 is to go in the OPPOSITE direction to the head. So if the head goes to the tank's left, the tank will instead go to their right. Draigoch will burn the tunnels in the direction he went, so anything in those tunnels will die. 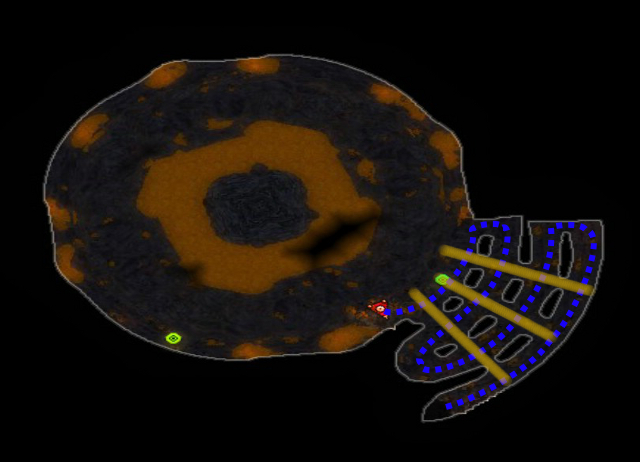 The Tank will need to tell the raid whether to run LEFT (Clockwise) or RIGHT (anti-clockwise) everytime Draigoch moves. Once all 4 claws have been defeated, the raid should wait until the white text appears on screen that Draigoch has fallen to the floor. It is then safe to run into the room and start DPS'ing Draigoch's Body. Meanwhile, the Tank and any associates will return to the western platform with the Treasure chest, as this is ALWAYS where Draigoch re-enters combat. The Burglar(s) will need to co-ordinate who will pop CJ's. One should be popped very shortly after running into the room. After a 20s immunity, a second CJ can be used. Never use more than 2 CJ's per knockdown, as it's almost impossible for the third to execute before Draigoch can recover. Be aware that if CJ's are not popped quickly when Draigoch is vulnerable, the second group might accidentally trigger one from DPS, given Draigoch immunity and preventing a successful execution. Once Draigoch recovers, the raid shall exit the main room from at around the 10 o'clock position, which will put them directly next to the ramp up to the western platforms. Run back up to the Front Claw platforms, and be ready to start DPS. After the first knockdown, take care when approaching any claws, as they may have fire puddle in front of them. For the front claws, it's possible to stand on the far right of the platform without standing in the puddle. On the rear claws, you should still be able to enter melee range from in front of the claw if you edge forward carefully. The fire puddles deal MASSIVE fire damage over time, so DO NOT stand in them! The raid will continue to DPS all four claws as normal, and continue to execute CJ's on Draigoch's body once he gets knocked down. The only difference to Phase 1 besides the head movement is that there is a slightly increased time period to DPS the claws. Draigoch the Red says "My breath is death, and your lives are but a trifle in my presence." The tell for Phase 2 is that AFTER he goes out of combat (while saying his above line), he will put one of his front paws on the FLOOR of the tanking platform (Do not get confused with his other paw which might be placed higher up on a rock). This time, the tank will want to go in the SAME direction as the paw. So for example, if Draigoch puts the paw on the tank's right on the platform (Which is actually Draigoch's front left paw), the tank will go to his right. Draigoch the Red says "Cowards! Stand and fight me!" At this point, the Tank and anyone with him should jump off the upstairs platform into the Treasure hoard and join the rest of the group. Everyone should group up at Draigoch's Rear Left Claw. After a short while, Draigoch will set all tunnels on all floors on fire, so anyone still inside will be killed, and anyone inside who needs a res will be unreachable. During Phase 3, Draigoch will fight the group on the floor of his treasure hoard. The raid will need to take down the four claws as usual, however during this phase you will always start with the rear left claw. Afterwards, go to the rear right, then front right, then front left. Typically, Draigoch will perform a move after killing the third claw. Make sure that you always stand behind claws when DPS'ing them, and continue to be as grouped up as possible. This is particularly important on the front claws, as Draigoch's head is capable of one-shotting any squishies who get too close. When Draigoch moves in phase 3, the raid (including the tank) will need to run to where Draigoch's tail is. This is because he will take flight, and set fire to the quarter of the room where his head and the tank used to be. When DPS'ing the final claw(s) after a move, take care to not move into the fire puddle. This lasts for a long duration. Although there is a slight tell for Phase 3, it's not critical to be aware of, and the tank doesn't need to communicate it to the rest of the raid. After Draigoch goes out of combat, he will take flight and set fire to the ground underneath his head. He will then turn left or right in mid-air, so if the tank watches which way he turns, he has an extra second or two to run to the new location. Additionally, a pair of Tornado effects will appear before Draigoch lands again - these always blow in the direction of his tail in his new position. Once Draigoch is defeated, he will start giving a long dramatic speech before he dies. At this point, everyone should run for the safety of the ground floor tunnels. This is because Draigoch is about to cause a cave-in with his last breath, which will kill anyone still in the treasure hoard. After you are finally told Draigoch is dead, and the group gets auto-bestowed their seal/medallion rewards, it's safe to re-enter for loot. 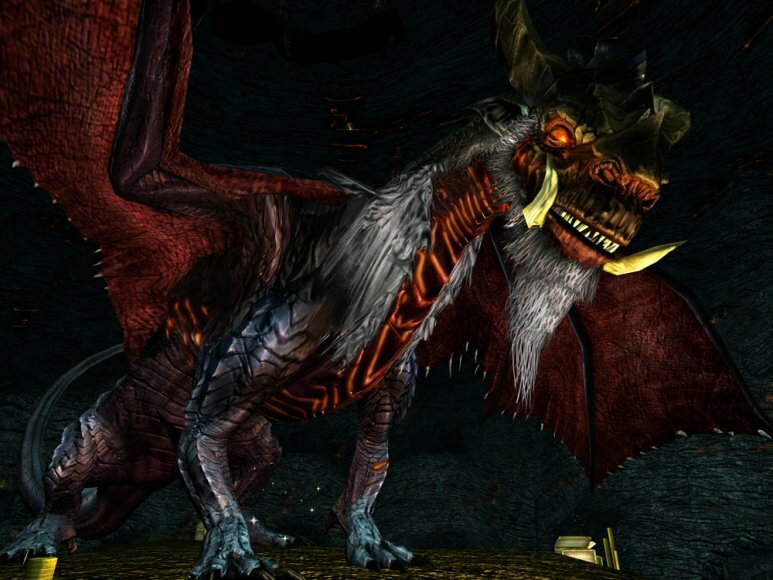 The following three quests MUST be completed in order to access Draigoch's Lair. Zudrugund is the Dwarf camp at the top of Nar's Peak in Enedwaith. You need to sucessfully perform all 12 Draigoch CJ's before defeating him.